ARE YOU A PROFESSOR? WOULD YOU LIKE A LOW-COST WEB SITE? 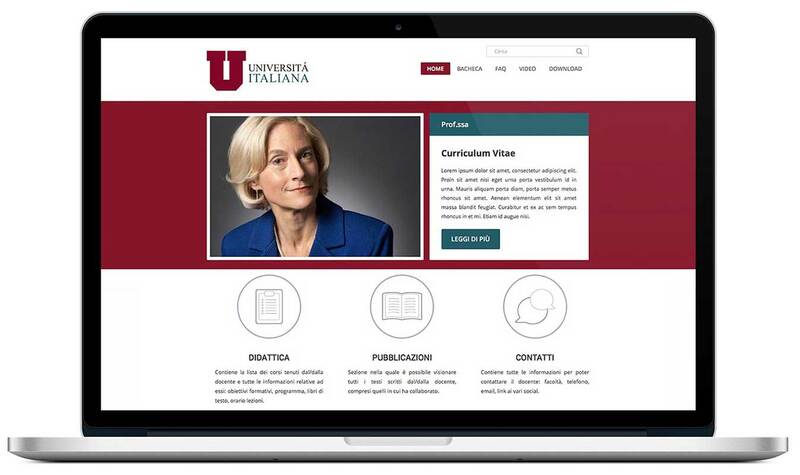 Discover PROF ON, the new digital teaching service for professors. With PROF ON you will get an efficient and independently manageable website. You will be able to post your news, teaching materials and information about classes and exams. You will have a user-friendly, customized and simple digital platform. The website features an easy and intuitive interface and eye-catching graphic layout. Easily accessible via a simple and immediate domain (professor’sname.com), it comes with your university official logo and colours. The contents are displayed in a clear way thanks to a figurative menu on both the home page and the header and they are organized in sections. Dashboard: A highlighted space to publish and display the professor’s posts related to teaching, including exams timetables, organized with a simple and intuitive calendar. FAQ: A space reserved for the most frequently asked questions, so that professors can answer in advance any doubt that students may have. Video: Section for posting videos of classes and interviews. Download: Section reserved for educational materials and downloadable content. Useful information: professors can also enter all their contacts, curriculum vitae and publications. Fast: The slow loading era has finally come to an end! Professors can now upload news, materials, and exams in a second. In addition, any update can be made directly from PCs, tablets and smartphones. Easy to use: The website’s back end is extremely clear and intuitive. Even less tech-loving professors can add new content through a simple editor and students will find the information they want with fewer clicks. Optimized: A website, to be useful, should be traceable. With our search engines positioning services, your website won’t be lost in the world wide web. Responsive: The website is always displayed correctly on any mobile device. Low-Cost: A minimum cost to get excellent service.